Beautiful silver and brilliants Past Master's suspended neck Jewel. The Jewel comprises of a normal Compass and Square, which is silver, into which brilliants are set, with a suspended "G", which is set on blue glass on a silver gilt sunburst. Dublin Goldsmiths Messrs J.R. Ryan & Co. of Dublin. Suspended "G", which is set on blue glass on a silver gilt sunburst. Short History of Warrant No. 158. 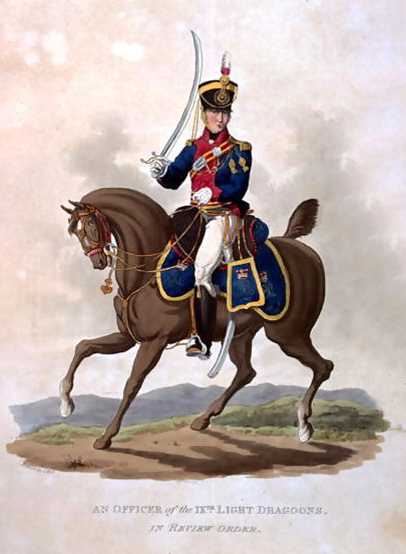 9th Dragoons, 1747 - 1815. Warrant No. 158 issued to Brethren in the 9th DRAGOONS or "Wynne's" Dragoons, on the 9th May, 1747. Volume 1 of the extant Grand Lodge Register records 91 brethren registered between 1st November, 1757 and 5th July, 1797. A List of the Lodges, and the names of the Masters and Wardens who compose The Grand Lodge of Ireland, from the 24 June to 27th December, 1793 includes Lodge No. 158, 9th Regt. Dragoons, Richard Johnston, William Wallace & Patrick Love, Horse Barrack. Read a report from the Committee of Inspection that Warrants 158, 195, 280, 390, 528, 542, 559, 604, 816, 988 having either been lost or not acted upon for a number of years should be declared Cancelled. Confirmed." In accordance with the Grand Lodge Order Warrant No. 158 was cancelled on 6th April, 1815. Warrant No. 15, 1818 - 1856. Warrant No. 158 reissued to brethren in CASTLEBLAYNEY, Co. Monaghan on the 4th June, 1818 in lieu of Warrant No. 951. Warrant No. 158 was cancelled on the 6th February, 1845. Warrant No. 158 reissued to brethren in BALLINROBE, Co. Mayo, 8th February, 1848. Grand Lodge ordered that Warrant No. 158 be cancelled on the 5th July, 1856. History of Eblana Lodge N0. 158, 1867 - 1983. "Lodge 158 - 2 December, 1867 – Read a Memorial of Br. Maurice E. Solomons and others for a Warrant to open a new Lodge in Dublin, praying that No. 156 or any earlier number may be assigned to them. Enclosing a Draft for £7. The Board recommend that the prayer of Memorialists be complied with and that No. 158 be given to them." Warrant No. 158 reissued to Brethren in Dublin, to be known as `Eblana Lodge' in FREEMASONS HALL, MOLESWORTH STREET, DUBLIN on the 11th December 1867. Series three Vol. 7 of the extant Grand Lodge Registers shows Warrant No. 158, Dublin 11th December, 1867 - Denis Joseph Field; James Robert Ryan and Maurice E. Solomons all from Lodge No. 120, registered 11th December, 1867.On the 11th December, 1867 ten brethren from Lodge No. 120 are shown as affiliating in the said Register. No indication as to Master or Wardens. Alfred Cort Haddon, a British Zoologist and a member of Dalkey Lodge No. 261 was raised to the sublime Degree of Master Mason the Brethren of Eblana Lodge No. 158 on the 6th June, 1888. A total of 147 brethren registered up to 6th June, 1900. In most cases the dates when the degrees were conferred and the issue of certificates is shown. The Belfast News letter of the 27th July 1906 had an account of the funeral of Bro. Percival Jones, the deceased Secretary of Eblana Lodge wherein it was noted that he had been Secretary of Lodge No. 158 since its foundation - Bro. Jones was clearly dedicated to his Office. Five members of Eblana Lodge No. 158 served in the 1914 -18 War and all returned. A total of 114 brethren registered up to 1st March, 1922. In most cases the dates when the issue of certificates is shown, together with the occupation of the brother. Series five Vol. 18 shown as Vol. 2 of the extant Grand Lodge Register comences with the registration of Charles G. Wright, Accountant, registered 3rd December, 1924. A total of 56 brethren registered up to 2nd May, 1951. In most cases the dates when the issue of certificates is shown, together with the occupation of the brother. The Handing in of Warrant No. 158 was noted in the Grand Lodge Minutes of 8th October, 1983 as "Confirmed"
WARRANT NO. 158 LABOURED, ON AND OFF, FROM 1747 TO 1983, FOR A PERIOD OF SOME 236 YEARS. Eblana Lodge No. 100 in fact only Laboured for less than seven years, handing in its own Warrant in 1990.